“All over the world, mothers and fathers, grandparents and cousins, brothers and sisters, uncles and aunts, love their children very much and call them by many different sweet names,” writes Jacqueline Ogburn in her box of bonbons filled with charming endearments in 14 languages. Whipping up whimsy in this little treasure, Mr. Raschka provides exuberant ink, watercolor, and gouache illustrations marked by big eyes and simple, broad, brushstrokes in party shades; prom-dress pink, emerald green, gold, baby blue, and tangerine-hued children laugh, crawl, and bounce across the pages. Accompanied by Mr. Raschka’s childlike paintings, the terms appear in English and in their original languages, along with simplified phonetic pronunciations. Thus, whether it’s mon petit chou, or “my little cabbage,” as the French say, docinho de coco (“little coconut candy”), as Portuguese-speaking Brazilians might croon, or nor khalbi (“light of my heart”), as some Arabs call their munchkins, readers can share and savor the delicious variety of affectionate terms concocted around the globe. 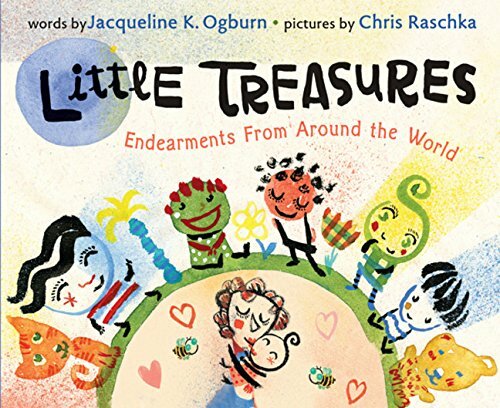 As this amiable picture book demonstrates so sweetly, love comes in all shapes, colors, and languages.